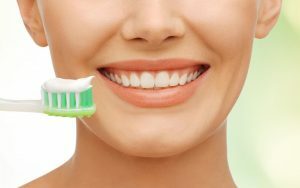 When it comes to preventing gum disease (as well as several other common oral health issues), preventing plaque buildup on your teeth and gums is essential. That’s because the bacteria that produce and hide within dental plaque are the main causes behind such oral health issues, especially when they’re allowed to accumulate excessively. While you have several options for addressing gum disease at our Encinitas/San Diego periodontal office, preventing gum disease from forming is a much better option for your long-term oral health. To be successful, your preventive routine should focus strongly on preventing excessive bacteria and plaque buildup every day. Dental plaque is a mix of hundreds of types of oral bacteria, food particles, and more. As bacteria accumulate within your mouth, they form plaque to cling to your teeth and gum line and protect themselves from things like water and saliva that could otherwise rinse them away throughout the day. The only way to remove plaque from your teeth and gums is to carefully brush it away at least twice a day and floss at least once. If you fail to effectively clean your teeth, then plaque will calcify (or harden) into tartar, which can’t be removed with toothpaste and water. When enough oral bacteria gather along your gum line, some of them can work their way underneath your gum tissues, safely away from your toothbrush and floss. This marks the beginning of gingivitis – or early gum disease – as it leads to an infection in your gums that progressively grows worse. The infection causes your gums to recede from your teeth, creating more space for more bacteria to accumulate. If not treated, gingivitis will progress into more serious gum disease and can lead to extensive damage to your gums, periodontal ligaments, jawbone, and more. If you develop gum disease, then protecting your smile from its effects will require addressing the disease as soon as possible. This will also require removing oral bacteria, though your periodontist will have to perform professional deep cleaning to remove them from your teeth roots. Depending on the extent of your gum disease, controlling could require one or more additional procedures, such as ozone therapy or platelet-rich treatments. With specialized, routine maintenance, you can successfully control gum disease and protect your smile for life. The oral bacteria found in dental plaque are the building blocks of gum disease and more, which is why preventing such issues requires effective, consistent plaque control. For more information, schedule a consultation with Dr. Kania by calling her periodontal office in Encinitas/San Diego, CA, at (760) 642-0711.